“Guitar Mike” – 1960 Teisco J5 Electric Guitar – Drowning in Guitars! Ahh, the small wonders that are early electric guitars. When you examine many of the first solid body electrics from Harmony, Kay, and Valco (in America) and Teisco and Guyatone (in Japan), then you see many similarities. Small bodies, thick necks and usually powerful pickups. You really can’t compare these early offerings to Fender or Gibson made guitars, who really seemed to be light years ahead in design and approach. But the “secondary” makers were all building electric guitars with a similar mindset. Of course you can argue the nuances and construction techniques, but when you start to think on a global level… Take for instance this early offering from Teisco. These “J” models were built in the late 50s and lasted until around 1961. Probably 1958-61. Somewhere thereabouts. Anyway, this model wasn’t the first solid body offered by Teisco, but it is arguably the first Teisco solid body Teisco electric that didn’t share lap steel characteristics and lap steel pickups. 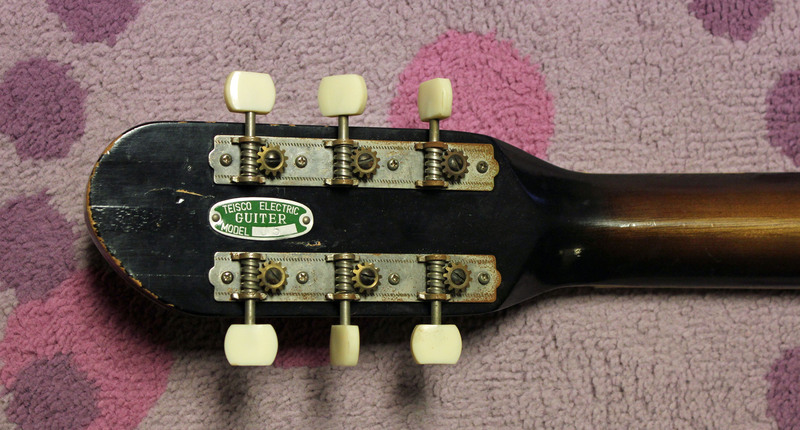 Previously, many Japanese solid body electrics were a sort of “bridge” between lap steels and electric guitars. This meant you could play the guitars sitting down or standing. But this model was an actual “upright” electric guitar! Hey, novel idea! These were also among the first guitars aimed at western players and people. Notice the little label on the pickups? They say “Guitar Mike.” They were using English words now and these guitars were being sold at American military bases and installations in and around Tokyo. This was the only Teisco style headstock to feature this shape and the double racing stripe just looks so cool. And there’s that early Teisco “swan” logo that I love. The tuners are very decent on this guitar and really these are well-built instruments. They features all-wood construction and good frets. Of course, they are crude when compared to modern guitars, but the Japanese electric builders (there were only two during this period, Teisco and Guyatone) weren’t that far behind many American guitar makers. 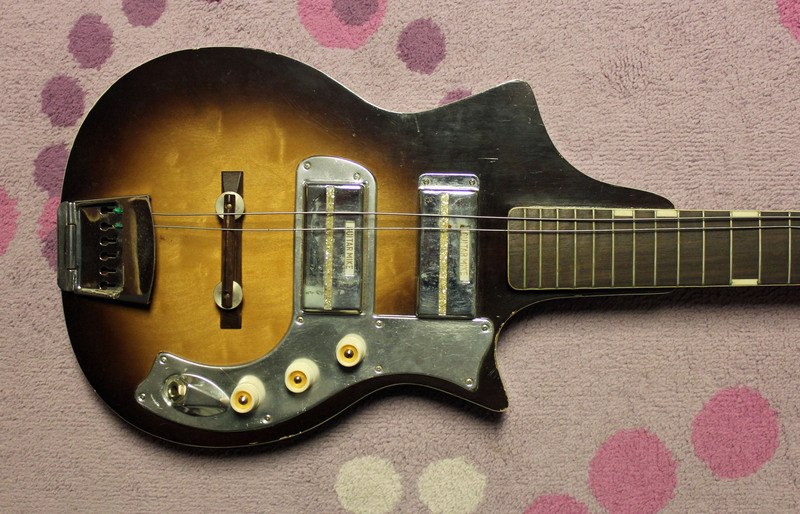 This J5 model didn’t have any pickup switching per se, but rather there were two volume knobs and one tone knob. Think of this model more as a “blending” combination. The neck is very thick and features a wonderfully deep V carve. I really like that full V shape in my hands when I play guitar, but there aren’t any current makers that feature such a deep V. Once again, I’m always in the guitar minority!! But there was a reason behind this thick neck, and that was to overcome the string pull without having a reinforced rod. The set neck design is very similar to the 1950s Harmony Stratotone, but the angle is never quite right on these guitars. Back then, if you had the good action at the first few frets, the “cowboy chord” area, then you were all good! But as you go up the neck the action gets higher and higher. These guitars were usually like this from day one. It can be corrected with a few different methods like heat and neck resets. What I find amusing about these 1950s Japanese solid bodies is that almost all of the bodies and necks were made by one man living in Tokyo. See, at this time Teisco was primarily an electronics manufacturer and not a woodworking shop. So all these bodies and necks were being churned out by one guy who lived near the factory. But this same guy also made guitar bodies for Guyatone! So the first two electric guitar makers in Japan, had factories that were within walking distance in Tokyo, had the same small woodworking shop making all the wood portions for both companies! He must’ve been busy as hell!! 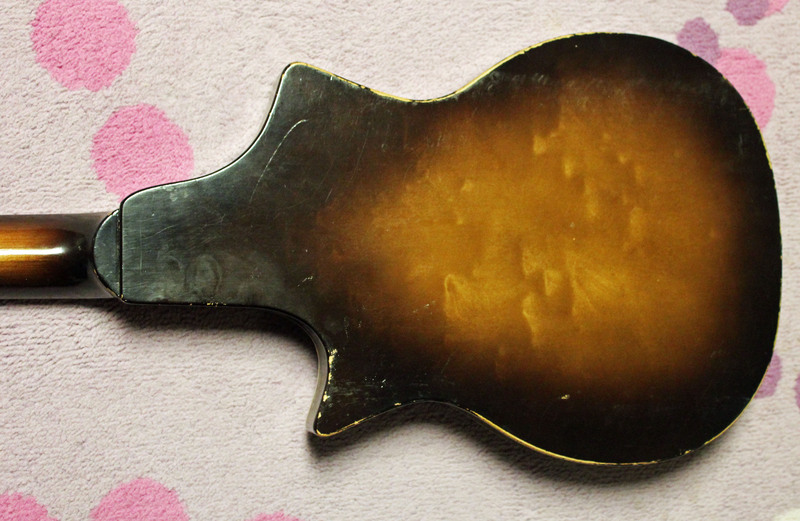 There weren’t many of these guitars made and even fewer have survived the years. There was also a one pickup variation of this model called the J4. But both models are scarce. I was lucky enough to buy two of these. The first was when I visited Japan, and the second I bought here in the states. 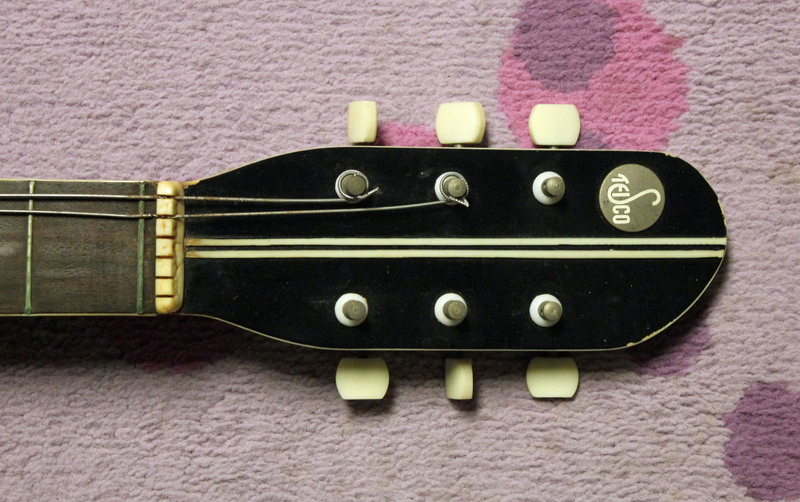 This is the second guitar and it came with the original case, chord, and two of the strings. I left the strings on there because I also found out that during the early days of Teisco, the employees were actually making guitar strings in-house! How crazy is that!?!? They bought piano wire from Germany and somehow figured out how to make the different gauges. There weren’t any electric guitar string makers in Japan!! Anyway, here’s a video of Mike Dugan playing the first J5 I bought. Dig it! Got a teisco solid body j5-ish I think 58? Got a different shape I cannot find identical to it in shape has the handmade original strings and the headstock is not quite the same shape as any other teisco but it’s got the stamp riveted on there. It is in enigma want to buy it ? I just “rescued” a GemTone bass with very similar pickguard design (mine’s brushed aluminum I think) and pickup covers, complete with gold-ish foil covering the poles. I’d post a pic but there doesn’t seem to be that option.